I’ve been meaning to participate in a Top Ten Tuesday for a while now and just never seem to get organized enough to do one of these but this week I’m prepared! 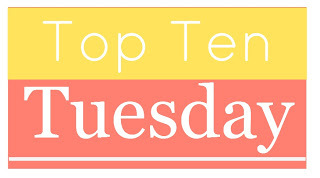 So Top Ten Tuesday is an original feature/weekly meme created by The Broke and the Bookish. Each week a new topic is listed and for this week it’s Ten Favorite Beginnings/Endings In Books. “I went to sleep with gum in my mouth and now there’s gum in my hair and when I got out of bed this morning I tripped on the skateboard and by mistake I dropped my sweater in the sink while the water was running and I could tell it was going to be a terrible, horrible, no good, very bad day.” From Alexander and the Terrible, Horrible, No Good, Very Bad Day by Judith Viorst. “Once upon a time, there were five French soldiers who had gone off to war, because that’s the way of the world.” From A Very Long Engagement by Sébastien Japrisot. “No one who had ever seen Catherine Moreland in her infancy, would have supposed her born to be a heroine.” From Northanger Abbey by Jane Austen. “Mrs. Dalloway said she would buy the flowers herself.” From Mrs. Dalloway by Virginia Woolf. “Last night I dreamt I went to Manderley again.” From Rebecca by Daphne DuMaurier. “In eighteenth-century France there lived a man who was one of the most gifted and abominable personages in an era that knew no lack of gifted and abominable personages.” From Perfume by Patrick Süskind. “We came on the wind of the carnival.” From Chocolat by Joanne Harris. “One village post office in Austria is much like another: seen one and you’ve seen them all.” From The Post-Office Girl by Stefan Zweig. “A green hunting cap squeezed the top of the fleshy balloon of a head.” From A Confederacy of Dunces by John Kennedy Toole. “So that’s settled, then; we bury her alive in the iron bridle.” From Company of Liars by Karen Maitland. Some of these are books I’ve loved since childhood, some are classics and some are fairly recent reads that were quite memorable. I had such a fun time putting this list together as I got to look through my shelves and revisit with some favorites. How about you, I’m sure you recognize some of these lines. What are some of your favorite beginnings? I agree, you’ve chosen some great lines that absolutely make a lasting impression. Of course, the opening lines/paragraph of Rebecca have probably had the most influence for me over the years because I will never forget the atmosphere DuMaurier created. I see some other opening lines of books I haven’t read that draw me in…guess I’ll have to check some of them out! Heather – I know right? Who doesn’t know that line! jenclair – I agree, the atmosphere she sets is wonderful. I need to read more of her books. I was quite impressed with My Cousin Rachel too. Alice in Readerland – Yay, another fan of Alexander 🙂 I enjoyed reading your list too! Lauren @ Books, Tea & Me – You are in for a treat! It’s a wonderful read – I hope you enjoy it! Bookworm – I saw that! 🙂 I had to add Jane Austen and it looks like a lot of people have too! What an inspired idea. I’ll follow this up one of these days by roaming randomly through my bookshelves. Having stumbled upon your treasure trove through a comment you left on Dina Ross’s site, I hope to return and browse here many times.